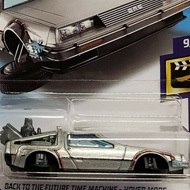 FYG13 is 138/250 in the mainline set, 7/10 in the Nightburnerz series, and part of the 2019 Super Treasure Hunt set. It is Spectraflame blue with light blue camouflage stripes as well as white and yellow stripes. Detailing on the sides and hood include “J-LIU”, “WOL-16”, and “1.5” inside a red & white circle. “TH” and the Hot Wheels logo can be found on the sides and in the camo on the roof. The truck has clear windows, a black interior, Real Rider wheels, and a chrome plastic Malaysia base. 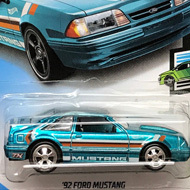 This vehicle can be found in mix “F” of 2019 Hot Wheels mainline cases. The Mazda REPU made its debut in the 2017 HW Daredevils series. It is based upon the Wankel-engined truck that was sold from 1974 to 1977. It is the first and only rotary-powered pickup.